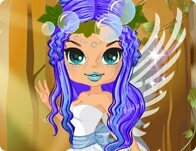 This beautiful fairy needs a makeover, so feel free to use magic and fairy dust to give this pixie a fantastic edge! Pamper yourself at the local spa and lift your spirit for the next week. Your friends flock to you for your fashion sense. Help them design this week's clothes, so they are styling at school. Megan have a developed sense of fashion and she is always up to try a new look. Be part of this makeover experience! Your friend is giving you the authorization to style her the way you want. It's time to be creative! As an experienced stylist, you have to coordinate hair style, makeup and an outfit that will highlight the features of your friend. Don't forget to embellish with accessories. Enhance the beautiful features of this model by styling a new hairstyle, a fresh cosmetic made up look, and trendy clothes! Give this trendy stylist a makeover! Help Amber put create a new look something fun and colorful! You're getting a manicure but not just any manicure, an Amazing Manicure! How do you like your hair and makeup? Use this very realistic model to refine your talents as a make-up artist and hair colorist. Playing with make-up is always fun. Create a natural or unique look by using the different eye shadow palettes, lipsticks, and hairstyles.